The absence of plants in an African Cichlid tank can be compensated by a rocky decor that provides the fish with shelters and hiding places; polyurethane and polystyrene can also prove very effective for fulfilling the same purpose. For Lake Tanganyika, you can introduce the Cyprinodontid Lamprichthys tanganicanus or a species of Lamprologus, which takes refuge in a gastropod shell. 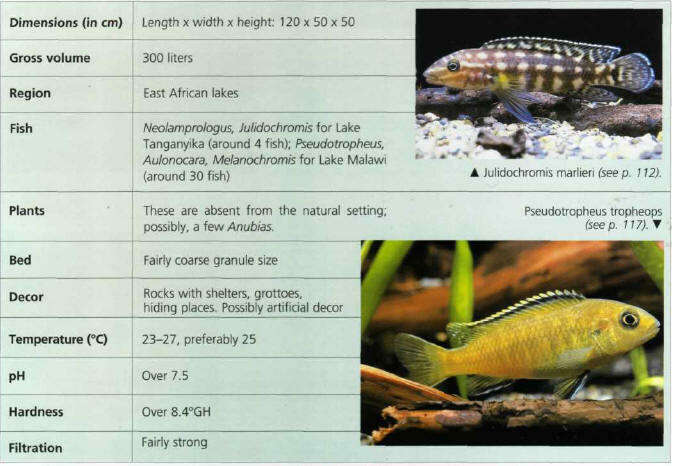 For Lake Malawi, you can add species of the Haplochromis genus. These reproduce through mouth brooding, ensuring that the hobbyist can look forward to a fascinating spectacle once he or she has spotted a female with her mouth swollen by eggs. АЛЕКСЕЕВ Александр Емельянович (1891-1975) , российский электротехник, член-корреспондент АН СССР (1953). Труды по электрическим машинам, электрической тяге. Государственная премия СССР (1949, 1951).